professional members of the IPA for at least three consecutive years. Institute for Complementary Therapies (IICT)’. an extraordinary                                                   has penned articles for the Herald Sun. well. She learned Usui Reiki in 1992 and has   and the International Psychics Association. for over thirty years. In 2018, Doreen started   Certificate IV in Training and Assessment. 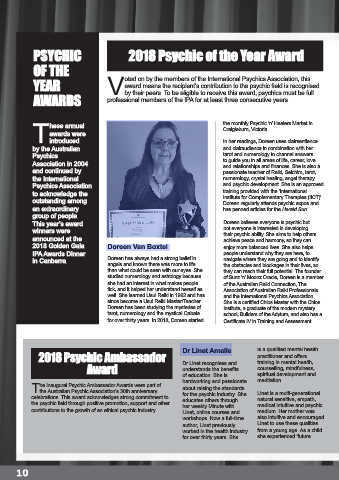 contributions to the growth of an ethical psychic industry.